Arrieta entered 2017 with a couple fewer mph on his pitches and, while his walk issues dissipated, he was giving up more homers than he ever had as a Cub. Batters were also finding holes a lot more against him; while his BABIP was still very low last year at .241, it was .318 entering July this year. Sitting on a 4.67 ERA entering July, Arrieta was bad for different reasons than he was in the second-half of last year. But bad is bad. And Jake had spent a full year not being very good. The velocity loss was unnerving. Oftentimes a loss of velocity is a harbinger of doom for a pitcher. It can be a precursor to an arm injury. And it definitely can lead to worse results. Even worse for Arrieta, he was losing more velocity during games than any qualified starter in the league. As I pointed out on twitter, during his June 27 start, Arrieta's average sinker velocity was 3 mph slower in the 5th inning than in the 1st inning. That was worse than his in-game velocity loss had been all year -- around 2 mph on average at that point. This appeared to be a major problem to me. While most starters' in-game velocity loss gets smaller as they build up stamina later in the year, Arrieta's in-game velocity loss was growing. Combine that with his struggles and his overall loss in velocity, and I was very worried. I wondered if an arm injury was just around the corner. At best, I earnestly doubted that we'd see much positive in his performance the rest of the year. Since then, Arrieta is only losing around 1.3 mph on average between the 1st and 6th innings. That's equal to his in-game velocity loss last year. His average sinker velocity loss between the 1st and 6th innings has only been over 2 mph once in his last 11 starts -- in a start back in July. Oh yeah, since that June 27 start, Arrieta also has a 1.69 ERA. My worries were completely unfounded. Arrieta has spent the last two months reclaiming his throne as the ace of the Cubs' staff. But how? On the whole, his velocity hasn't gone back up. He's still averaging around 92.5 mph with his sinker, as he's been doing all year. He's not getting more movement on his stuff. His walk rate has dropped a little, from 8.1% pre-July to 7.6% since. However, that's come with his strikeout rate dropping from 24.2% to 21.8%. His average exit velocity is down, but only barely, from 87.1 mph to 86.6 mph. Still, the results have been night and day. I've been stumped on how Night Man turned into Day Man. Well, we can't tell too much from that. The hot spot is right in the middle of the zone and stretches out across the whole zone. That's how it was when he won a Cy Young in 2015, too. There are minor differences between his pre-July heatmap and his heatmap since then. But it's the same pattern: sinkers all over the zone. 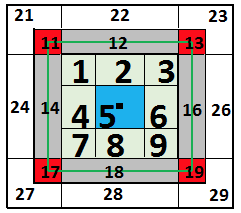 In 2015, Jake threw 7.8% of his pitches in the blue square in the middle of the zone. Before July this year, Jake threw 6.4% of his pitches in that square. Since then, he's thrown 8.1% of his pitches there. That is... not what I was expecting. He was avoiding the middle of the zone earlier this year more than when he's been successful. Surely, he's placing his pitches more on the edges now, though. Right? Nope. In 2015, he threw 38.7% of his pitches in the boxes with the green lines (which represent the edge of the strike zone) going through them. Before July this year, that number was 38.7%. Since then, it's at 35.3%. Again, the exact opposite of what I'd hoped to find. Intuitively, it doesn't make sense. How did he get better once he started throwing more pitches right down the pipe, if his stuff didn't get any better? Well, we have to think about Jake differently. He's not like other pitchers. For one, his stuff is nasty. His pitches have a lot of movement. And he throws the ball differently than other pitchers. He pitches across his body, which makes his pitches come in from different angles. His pitches are harder for the batter to pick up. The reason Jake is good is because batters have no idea what his stuff is doing or where it's going. His pitch might be heading for the middle of the plate, but that doesn't do the batter much good if he can't tell that. When Hector Rondon throws a 98-mph fastball that is straight as an arrow right down the pipe, it's easier for the batter to pick up and jump all over. I think Jake would rather not throw his sinker right down the pipe. But it's not such a big deal if he does. 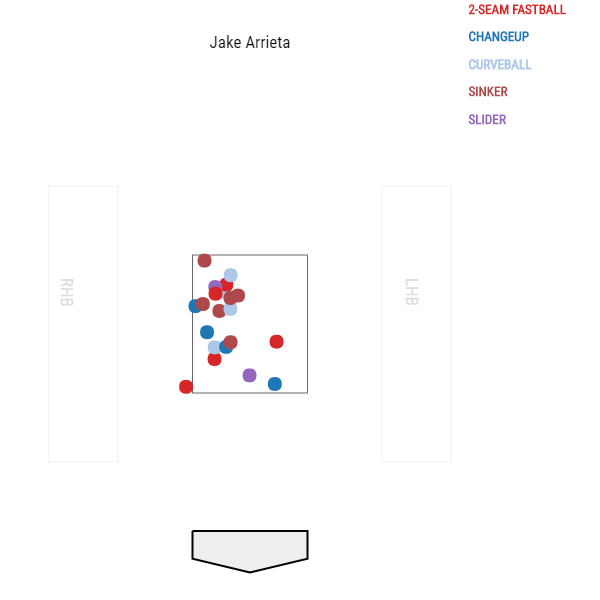 Of the 132 pitchers that have thrown at least 1,500 pitches this season, Arrieta's thrown the 66th-fewest % of his pitches right down the middle. (You'll notice Hendricks and Lester are 3rd and 15th). It doesn't matter because hitters only slug .323 against Arrieta on those pitches, which is second-lowest behind Max Scherzer. He doesn't paint the edges like Hendricks, either. While Kyle leads the league in % of pitches thrown on the edges, Arrieta ranks 113th. There are a few reasons for this. Jake is trying to beat you with stuff. He isn't trying to paint. If you can't hit it when it's right down the pipe, then why bother nibbling? Also, since his stuff has such wicked movement, it's going to be more difficult to have pinpoint accuracy with it. Regardless, we've gotten nowhere. 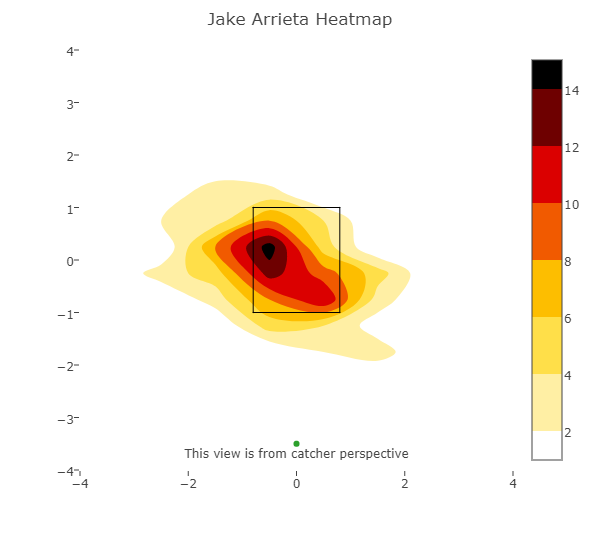 There is seemingly no way to tell if Jake's command has improved because he throws his sinker all over the zone and he doesn't care if it goes right over the heart of the plate. I've been all over Fangraphs, Baseball Savant, and Brooks Baseball looking for answers elsewhere. I've pored over zone profiles and heatmaps and game logs. I've split it up against left-handed batters before and after the start of July. I've split it up against right-handed batters before and after. I've looked at changeups before and after. I've looked at sliders and curveballs and four-seam fastballs. I've had dozens of tabs open on my computer. I have pages of notes written and scratched out. And what have I found? Look at all those sinkers on the inner third by the right-handed batter's box. It shouldn't be that big of a surprise. League wide, right-handed batters slug .372 on sinkers and two-seam fastballs from right-handed pitchers on the outer third. They slug .492 on sinkers and two-seam fastballs from right-handed pitchers on the inner third. This makes sense, as those pitches on the inner third start off over the plate and break into the right-handed batter's bat. The ones on the outside start off the plate and stay away from the batter's power. The distribution is the same across the plate, like we'd expect. However, there simply aren't as many sinkers being hit for extra-bases. This influenced me to search for all sinkers to right-handed batters on the inner third that were put in play before and after the start of July. You can see in the count breakdown of these balls in play that a lot of them came when the count was 1-0, 2-0, 3-0, and 3-1 before July. 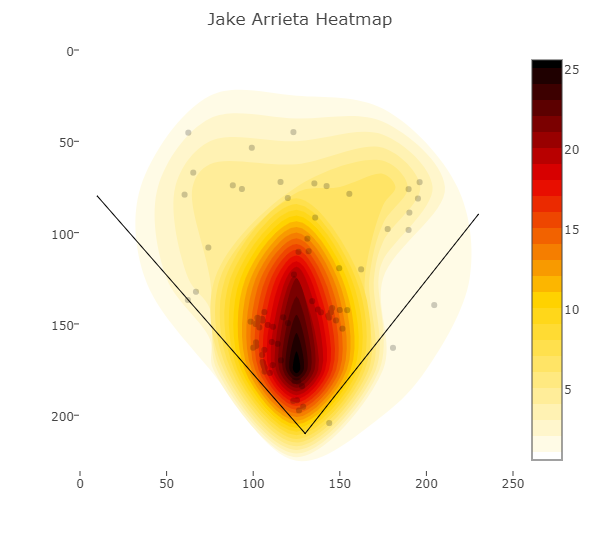 Since then, the balls in play are often coming when Arrieta is tied or ahead in the count. No sinker on the inner third to a right-handed batter has been put into play on a 2-0, 3-0, or 3-1 count since the start of July. Moreover, since the start of July only 39% of his sinkers on the inner third are being put in play, compared to 46% before July. That's it! Before July came around, when Jake got behind in the count, he left his sinker on the inner third. Now, he's staying away from there, like he did in 2015. He's obviously trying to get a strike in those situations. Early in the year he was either choosing to throw them right in a guy's wheelhouse or he was missing his spots. If I had to speculate, I'd say he knew he didn't have his command and was just trying to get it over the plate, and the sinker movement led the pitch to the inner third. Now that he's regained his command, he feels more comfortable starting it off the plate and bringing it backdoor for a strike. When Jake does that, it's an impossibly difficult pitch to hit. 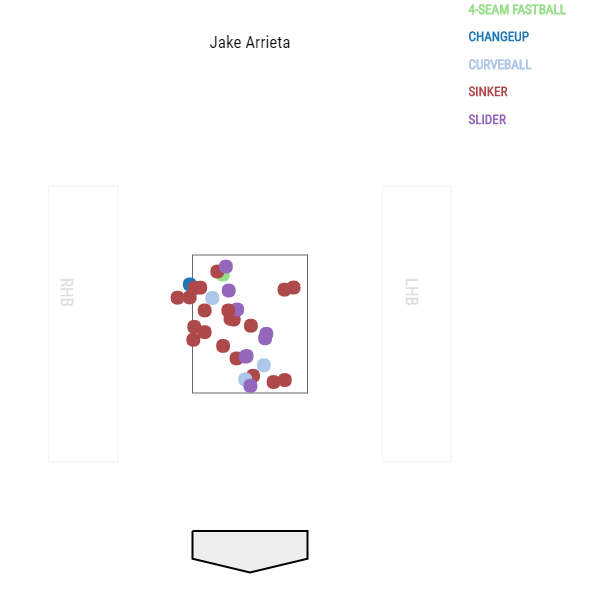 As we saw when we first started digging into Arrieta's command issues, he'll still throw his sinker all over the plate. Additionally, batters struggle to do much with the ones he leaves over the middle of the plate. The problem with leaving the sinker on the inner half on a 2-0 count, though, is that the batter is sitting on that pitch. Jake has a lot of different pitches with a lot of different, nasty movement. It's a tough pitch to react to if you aren't expecting it. If you are expecting it, and you get it right in your wheelhouse, the pitch loses its edge. This is definitely where some of the dissonance is coming from in his numbers and his zone profile. He's throwing the same pitches with the same movement, but it's more about how he is distributing them. He's better able to keep hitters off-balance now. And he is able to execute pitches when he needs to do so. He's pitching with conviction. Before July, it appears that when he need to make a pitch, he had no hope but to try to throw it down the middle. With his command back, he has confidence in his pitches. You can tell by how much he is using his sinker. Before July, he was throwing his sinker 55.5% of the time. Since then, he's thrown it 68.1% of the time. We can see evidence in his confidence in the sinker more clearly when we look at how often he's thrown it when he gets behind in the count -- especially when he's facing a right-handed batter and can drop it in backdoor for a strike. Before July, he was throwing his sinker 58.9% of the time to right-handed batters when he was tied or ahead in the count. He bumped his usage up -- like most pitchers do -- to 62.7% when he got behind in the count. Since July, he's thrown the sinker 61.9% of the time when he's tied or ahead in the count against right-handed batters. And when he gets behind, he's throwing it an astounding 83.2% of the time. Nearly all of the increase in sinker usage comes from when he gets behind in the count. The numbers are similar against left-handed batters, though not quite as drastic. Jake's been better against lefties since July, too. But they are only slugging .052 lower overall. Righties, on the other hand, were slugging .402 against him before July and are only slugging .198 since. His sinker command is largely responsible. While righties were slugging .400 against his sinker before July, they are only slugging .165 against it since. 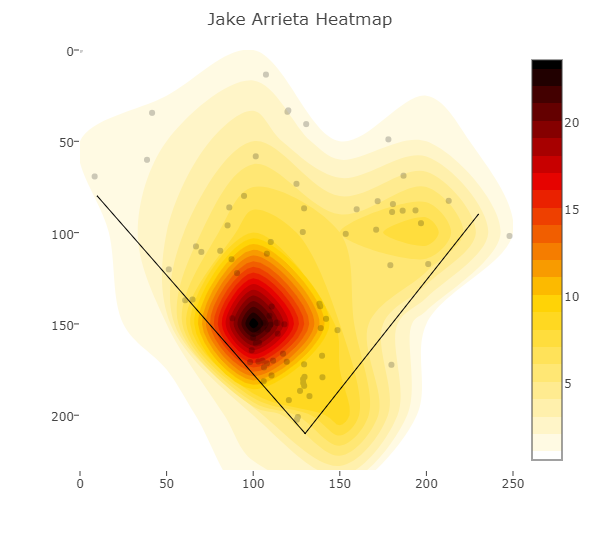 According to Pitch Info Pitch Values, Arrieta had the league's most valuable sinker in 2015. He had the most valuable sinker again in 2016. This year, his sinker has been the 2nd-most valuable. Before July, it was barely an average pitch. Since then, it's been lethal. His command explains it all, too. Again, his changes against left-handed hitters haven't been quite as severe. 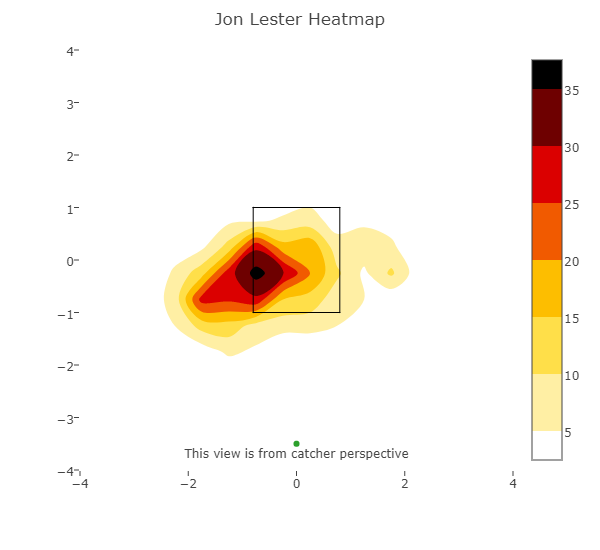 But, if you look at his spray heatmap for his sinker against lefties since July, you'll notice it's a lot closer to what it looked like in 2015 rather than pre-July. 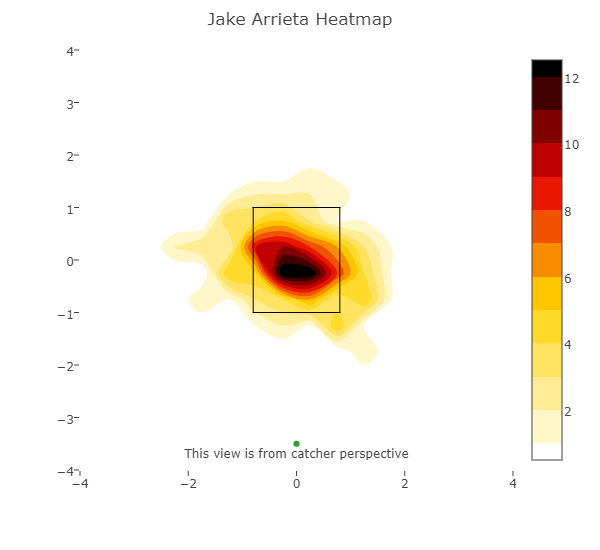 There are some other slight differences in Arrieta before and after July, too. But I think we can attribute most of Arrieta's success to his reclaimed sinker command. It should be mentioned that some of these differences are assuredly due to luck. If we compare Arrieta's wOBA and xwOBA before and after the start of July, it looks like his luck shifted right around the same time his command shifted. Arrieta's wOBA was .335 and his xwOBA was .308 before July 1. Since then, his wOBA is .254 and his xwOBA is .273. So, he's definitely pitching much better, as evidenced by the dramatically lower xwOBA. But he's also had Lady Luck on his side. I wrote a lot earlier in the year about how unlucky Jake had been with his BABIP and HR rate, which were both unsustainably high. Now, things have evened out. It's really been two diametrically opposed halves. Bad and unlucky turned into good and lucky. It won't matter how lucky he is, if he keeps pitching like this, though. When Jake has this kind of command, he's one of the best pitchers in baseball. And this year might be his turn to shine in the playoffs. Someone else will have to do the Charlie Work.